A few games and handy apps, along with a standard two-megapixel snapper. That’s your lot. The light-up panel on the front is nifty and the handset is slim too. While the retro flip style looks good, the hinge feels a bit flimsy. A full battery will last you days as long as you’re not going mad with the data apps. Performance is pretty good, even though we found some apps (the Opera browser, for instance) took their time firing up. The social media apps are pretty basic and the Opera browser is not user friendly. And typing messages is not simple on the numeric keypad. 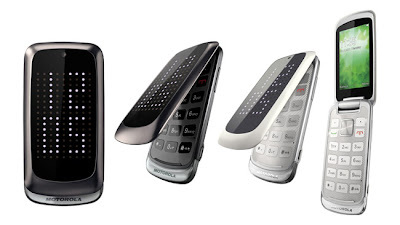 Flip phones have a real retro feel, combined with a touch of Star Trek – but Motorola’s Gleam Plus (or Gleam+ as it’s also known) manages to combine its retro style with some neat new features, which make it feel like a really fun handset. In the past, flip phones were cumbersome devices that were hard to slip into a pocket, but Motorola has managed to get past this and produce a phone that measures a svelte 13.5mm. Okay, it’s chunkier than your usual candybar-style handset, but still not a heavyweight. It’s light at a tad more than 100g, but still manages to feel robust. It’s a shame that once you open up the device, it doesn’t feel quite so solid. It’s the hinge that is flimsy – the lid and body are robust – and we were worried that if we pushed the lid back we might break the plastic hinge while putting the phone to our ear. What we do love though is the light-up panel on the front of the Gleam Plus. On the side you’ll find the volume button – push it and the phone shows you the time using large numbers – a bit of a gimmick but neat nonetheless. At the base of the phone is a slim lip, which glows when you have any calls or messages. It’s quite surprising that with all this glowing and lighting up, the battery will keep going for days, as long as you don’t go overboard using the data apps. If you like playing games, you’ll be in for a disappointment – there’s not much to choose from, There are some classic titles (such as Tetris) but an awful lot require you to be hooked up to a data server, which will be pricey if you don’t have a data contract. Other features include the usual calendar and calculator along with video and music players. You won’t really want to watch much in the way of TV programmes or films on the small display, and the audio jack is on the side of the handset, making it awkward to listen to music if you have your handset in a pocket. Texts, tweets and messages can take some time to type in because you have to use a numeric keypad, although having said that the keys are backlit in dark conditions, and well labelled. Getting online is done using the rather user-unfriendly Opera Mobile 10.1 browser. The screen (which measures 2.8in) isn’t touch sensitive, so navigation is achieved using a thumbpad, which is time consuming. The good news is that the homepage can be customised so that you can set up shortcuts to favourite web pages. When it comes to social media, you’ll find basic but functional apps for the likes of Facebook, Gmail and Twitter. The Twitter app, for example, lets you see tweets from everyone you follow, as well as check out profiles, retweet and reply. The snapper, which is a two-megapixel model, is average at best, and is okay for taking spontaneous pictures. There is no flash, so you can only take daytime shots; nor is there auto-focus, so don’t get too up-close-and personal to your subjects. There are some extras; continuous shooting for example, but this is redundant as each image takes 2-3 second to grab. For a retro flip handset that offers little more than basic features, the Motorola Gleam Plus is rather expensive at 80 quid. It is nicely designed though, and the light-up panel on the front is appealing. However, if we were going to pay this price, we’d opt for the Orange San Francisco II instead.